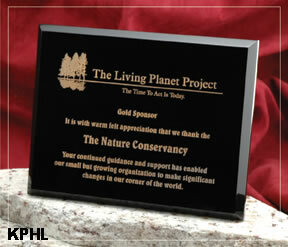 KPHL plaques are available with Gold, Silver or White color fill. One color is included in the standard price. 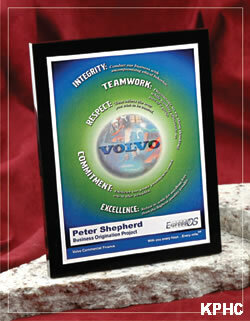 Both plaques on this page are 1/2" thick and feature a keyhole on the back for wall hanging. Size (WxH) Weight 1 - 5 6 - 25 26 - 99 100+ Part No. KPHC features a straight profile and a full color plate. KPHL features a 45 degree bevel and is laser engraved and color filled. Copyright 2008 AwardSmith, all rights reserved.